A phenomenon that annoys almost anybody is sweating. Nobody really likes to sweat. However, it is also something that is required for the human body. It is one of the ways in which your body adapts itself to the excessive heat. But, if you observe that you are sweating more than normal, consider getting checked with a doctor. You might be suffering from hyperhidrosis. However, it is not a life-threatening condition, and it can be treated through medication and surgeries. Surgeries are a very quick solution, but you can get your hyperhidrosis treated through medicines also. From its causes to symptoms, you can find everything you need to know about the disease as you read along. Certain people believe that hyperhidrosis is caused because of stress, anxiety, and peer pressure. It is true to some extent, all of these factors may affect the condition of a person. Also, people suffering from this disease often come across problems like stress and anxiety because of excessive sweating. Some other causes of excessive sweating are spinal injuries, alcohol abuse and diabetes. Hyperhidrosis generally starts during adolescence, and the signs are visible from a very early stage. Symptoms of the disease are not just visible to you but to everyone around you. You tend to start sweating more than usual. It does not have a major effect on any of your organs. But, it can certainly degrade the quality of your life. However, discovering whether you are sweating fine or not is hard to tell. The human body reacts differently under different circumstances. So, if you notice that your sweat is creating problems for you, then consider getting yourself checked with a doctor. Here are some of the most common symptoms of hyperhidrosis. This is one of the obvious conditions. You will evidently see sweat at almost every part of your body. But, some areas like your armpits will have huge sweat patches around it. If you see anything like this, you must consult with your doctor. 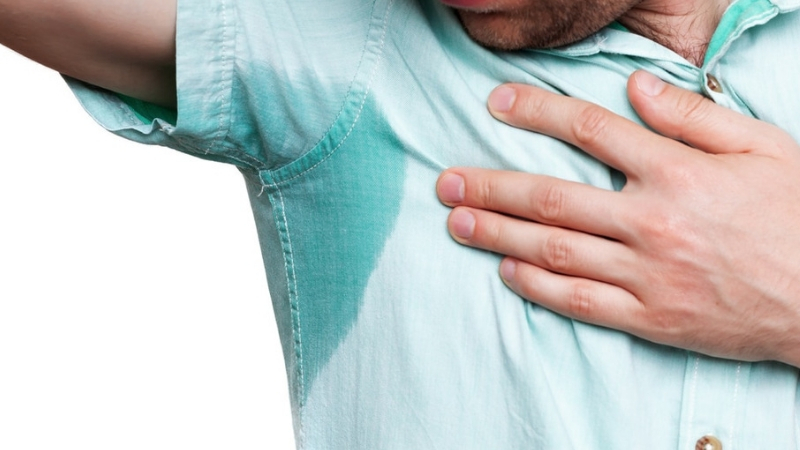 Sweaty palms are yet another sign of hyperhidrosis. Most people feel that it is absolutely normal to have sweaty palms. But, you should not really take this lightly. It might not be creating any issues for you now, but it may create issues in the future. So, if you have sweaty palms, you must get yourself tested. This condition does not happen in early stages. But, if you have been ignoring your sweating conditions for a very long time, you may experience this. However, your life is still not in danger. It is just that your hyperhidrosis has leveled up. People often face heavy sweating, chest pain, nausea and a feeling of light-headedness because of this condition. If you have been feeling the same for a very long time, get yourself checked with a doctor right away. There are certain ways of dealing with your hyperhidrosis while undergoing treatment. You always consider wearing a sweat proof undershirt to hide your sweat patches. It will help you regain your confidence. What Is The Best Cure For Hyperhidrosis? Clothes are no more a simple piece of fabric used to cover the body. Nowadays these have become more of a ‘personality speaking’ thing. The type of clothes you wear reflects out your fashion sense and groomed personality. Therefore, going wrong with outfits is the biggest blunder one can do. The evolution of clothes has paved ways to some styling methods and elegant solutions. Are you familiar with the irresistible yellow stains under the shirts? Well, we all are. The dressing trends over the years have transformed largely along with varying trends grooves along with some shortcomings. Besides wardrobe malfunctions, dirty and stained clothes may negatively impact your impression. It may degrade the quality of your clothing appearance. The first reason for this is the unwanted sweating phenomenon. Sweating is an essential function of a human body. It is entirely natural and favorable to maintain our body’s temperature. Sweating is vital for the detoxification of the body. However, it is unfavorable when it hinders with your look and outfits. It may accompany you at essential events where you tend to get nervous and stressed out. Unfortunately, they can welcome embarrassing moments as well. Now, one doesn’t want to fall prey to something like that, right. Sweating is only appreciated when you are doing an intense workout or vigorous training. But have you ever experienced heavy sweating where you need to change the clothes? If you are a victim of such a situation, then you are entitled to a medical condition called hyperhidrosis. Most of the times, it is area specific including palms, underarms or soles of feet. Many individuals are seen struggling with such unhappiness. Experts say that the percentage of men with hyperhidrosis is more when compared to women. Fit and good clothing is a true sign of a sophisticated person. There are a number of occasions where you are required to be well dressed. Workplace, social gatherings, outings or at parties, a groomed person is appreciated everywhere. However, if clothes are presentable one is ultimately applauded. And none of us wants to miss such a shot. A worthy day or event may turn into a complete embarrassment with sweat dripping down your clothes. Have you been in situations where you avoid handshakes due to excessive sweating? Well, a normal human being cannot avoid sweating but can always find the best options to reduce sweat. A sweated outfit is enough to bring disappointment and complications. Therefore, it is necessary to pay attention to hyperhidrosis. Hyperhidrosis may be caused due to some undefined reasons at times. However, allergy, infections and mental stress can trigger such conditions. In more serious cases, diabetes or thyroid problems also cause hyperhidrosis. It is highly observed in healthy and obese individuals. People dealing with hyperhidrosis are highly concerned about its curability. Well, there is always something instead of nothing. Certain treatments can minimize the amount of sweat, but complete eradication is not guaranteed. Treatments are crucial as well as expensive. Besides those, deodorants, antiperspirant sprays and other such remedies also exist in the market. However, they are limited to underarms only. Also, they are not very reliable and may go wrong frequently. Justifying science and technology came to conquer the wonder of sweat undershirts. These are a type of undergarments worn to avoid the sweat patches on your outer clothes. They are body sticking, worn under sheer garments or formal wears to hide the unwanted stains. Earlier this was one of the least popular wardrobes essential. With the growing popularity and desired results, these rule the undergarment market. Besides absorbing sweat they assure a neat, pleasant outlook, cover the chest hair and works for buttoned-down shirts. 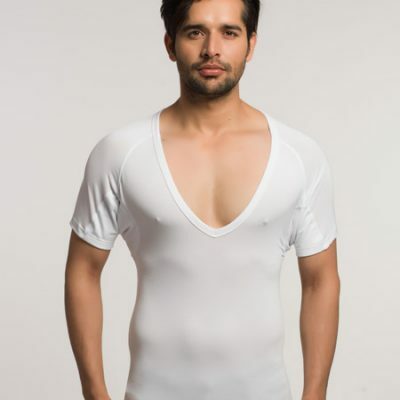 Undoubtedly, sweat undershirts are one of the best choices to avoid those yellow patches on your clothes. To buy the best quality with reliable fabric, visit Ngwear website. 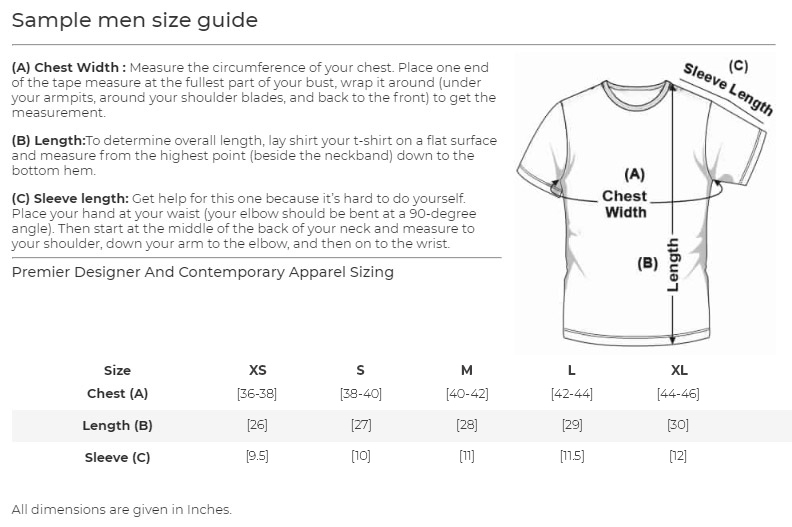 It is a perfect answer to why you should say yes to undershirts. The need for a secure and positive result was immensely needed. And to your luck, Ngwear has brought laurels to the country. 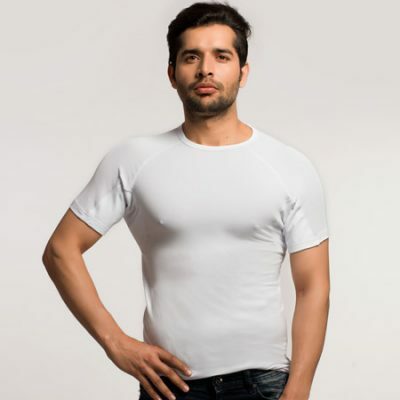 It is the only brand offering a multitude range of men sweat undershirts in India. Ngwear is the first country to adopt such a technology which ensures you sweat free outfits. 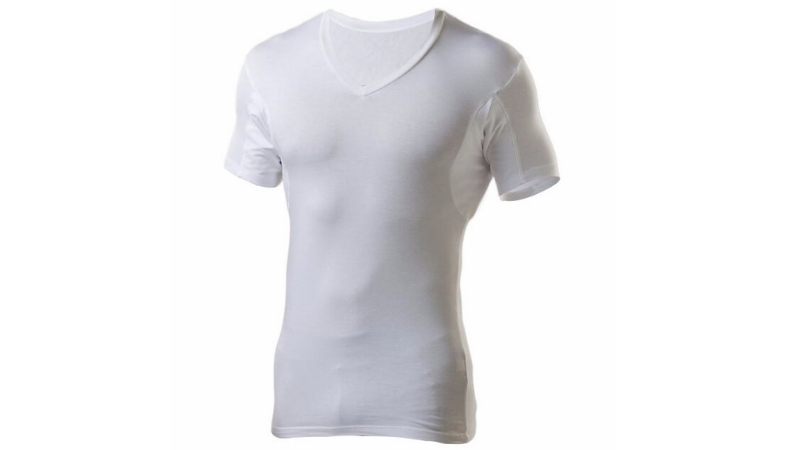 The store is endorsed with varieties of sweat proof undershirts including crew neck, v- neck, tank tops, long sleeved, etc.